MozBackup é um utilitário simples por criar backups de Mozilla Firefox, Mozilla Thunderbird, Mozilla Sunbird, Rebanho e perfis de SeaMonkey. O permite a backup e restaura bookmarks, correio, contatos, história, extensões, cache etc. 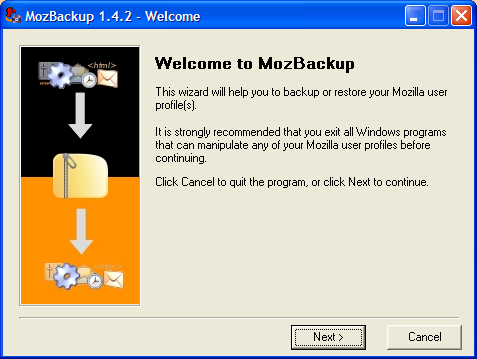 MozBackup is a simple utility for creating backups of Mozilla Firefox, Mozilla Thunderbird, Mozilla Sunbird, Flock and SeaMonkey profiles.It allows you to backup and restore bookmarks, mail, contacts, history, extensions, cache etc.